I’ve been doing a little knitting! This is the Cabled Tea Cozy from The Knitter’s Book of Yarn. I finished one side a few weeks ago, but I had to wait for my Malabrigo order to arrive before I could start the second side and keep going. The green is Lettuce, and the blue is Indigo. I like the way they go together. This pattern, designed by Jennifer Hagan, is just my kind of clever. There are all those interesting textures and cables and varied backgrounds, a sweet little i-cord handle that’s kitchenered together, a simple stockinette lining, and lots of i-cord bringing everything together. Besides, it’s fun! I took these pictures this morning, after I had seamed the two sides together. Since this cozy will be lined I decided to crochet the seam. It was an easy out, I know, but I like how well the halves fit. I moved on to the very cool seed stitch i-cord that edges the seam, and not long after the photo shoot I was attaching it all the way around. And now, after spending a wonderful afternoon knitting and watching old movies, I’m working on the lining, which is picked up around the bottom edge and knit in the round. There’s another i-cord to make, and about six inches of lining left to knit, and then I’ll have a beautiful cabled cozy for my non-existent teapot. My dear friend Kris pointed out that he has not one, but two teapots in his house. And he uses them, too. Merry Christmas! In keeping with my own weird tradition, I’ve already finished my KR Retreat New Beginnings project. It’s the Diamonds and Pearls Shawl, also from Clara’s book. Shelia January is the designer of this piece and several others in the book that I’m looking forward to knitting. 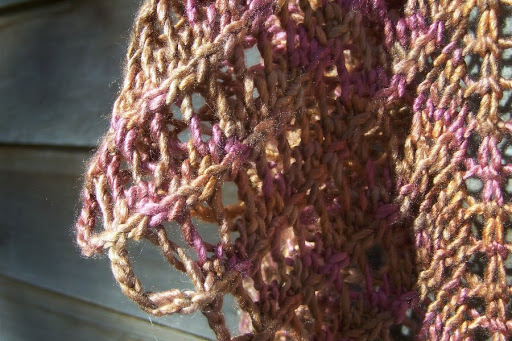 The yarn is beautiful worsted weight silk/merino dyed by Jen Heverly of Spirit Trail Fiberworks. 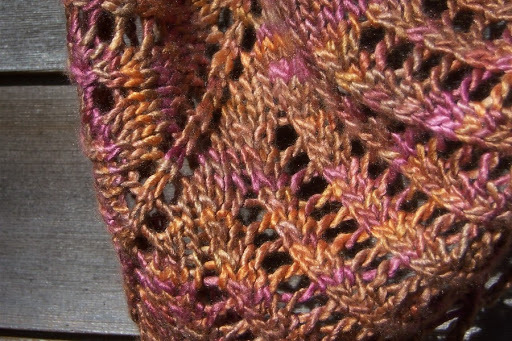 I used just one 200-yard skein, less than the pattern suggests, because I was working with a very different type of yarn than Shelia used in her design. The finished shawl is a bit smaller than the original, which is just right for me.The fabric I was getting was perfect on US 9’s so I didn’t want to go up a needle size just to make it bigger. 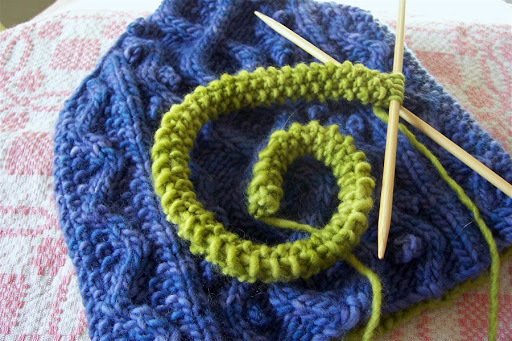 I began knitting on Sunday the 11th, and I finished on Wednesday the 21st. 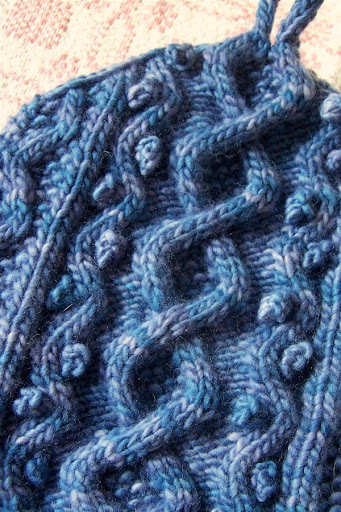 I did a quick blocking this past Sunday afternoon (love those blocking wires!) and by evening I was prancing around the house with my pretty new shawl on my pajama-ed shoulders. What could be better? Thank you all for your comments on my Thanksgiving post. Balancing the demands of work and my need to feel close to family and friends is always tricky, but I seem to manage. I sometimes feel like I’m on the verge, but verging isn’t always a bad thing. This year, as always, I spent a lovely day with Judy and her family. We created and enjoyed a wonderful meal, laughed a lot, and spent hours in good conversation.The store did well on the first holiday weekend, the customers were in fine form, and I remained sane. I can’t wish for more than that. Yay for staying sane!! 🙂 That shawl is absolutely stunning. Oh, Jane! 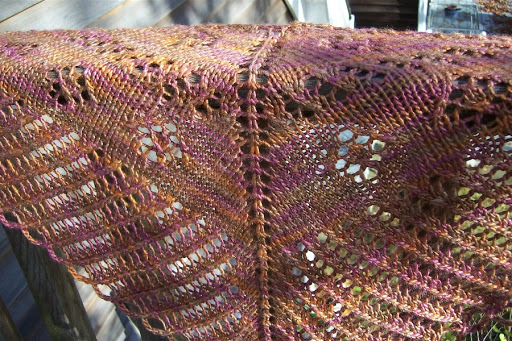 The shawl is gorgeous! I especially like how the subtle colors seem to shimmer and shine. 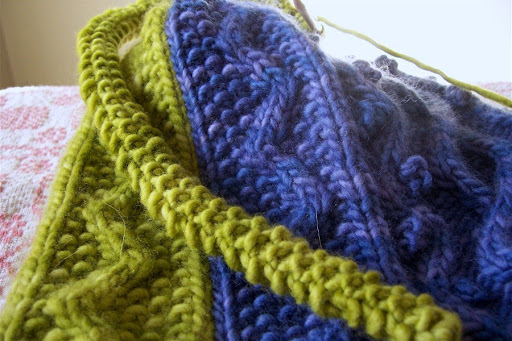 I love the colors in your shawl- and the knitting looks perfect! ooooohhhh pretty – are your bringing it tomorrow so I can see in person 😀 Wait till you see what I am doing …..
teapot cosy looks great – and i love your choice of colors. will have to look out for the book. Beautiful projects, beautiful colors. I love blue and green together, too. Jane, I can’t believe you’ve finished it already!! Now I really have to get going with mine! So inspiring to see what it looks like, before I even cast on!